In the 19th century Julius Wolff stated that the shape of a bone follows its mechanical function. Harold Frost clarified this observation and described systematically since the sixties, a control circuit called Mechanostat that explains the adaptation of bone to the mechanical forces acting on it*. To fulfil its mechanical function, bone must be able to adapt to changes in size or direction of forces, so that voluntary muscle contractions do not cause pain or even injuries to tendons, cartilage or bone. In addition, bone must be able to react to changes in metabolism and the environment. Therefore, bone strength (not bone mass) is a regulated quantity. The basic concept is a control loop: Muscle forces produce a deformation in bone. Osteocytes, by far the most abundant bone cells, are able to measure the local deformation of bone. osteoblasts add bone and increase its strength so that the deformation is reduced below this value. On the other hand, if a second, lower threshold is not regularly exceeded, bone is removed by osteoclasts so that the deformation is again in an area between the limits. Thus, the bone strength is constantly optimised, with a minimum of material. A characteristic of a stable control loop is the so-called negative feedback. Negative feedback means that the control circuit responds to a change so that the impact of change can be compensated for. If the typical local maximum force acting on an area of the bone is reduced, or changed in its direction, the local deformation (μStrain) is reduced in this area of bone. If this deformation is now reduced below the threshold for bone resorption, the local bone geometry is selectively altered by removing bone material. The goal is to adapt the local strength in the direction in which the force acts. As a result of this remodeling process the deformation returns to normal values with a reduced muscle force and bone mass. 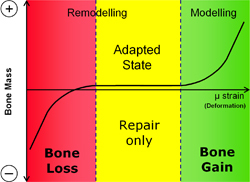 Increasing the local force, and therefore the local deformation, this process is reversed, and bone material is added to make the bone stronger until the local deformation is within the normal range again. During a period of adaptation this compensatory process obviously results in changing values. Therefore, in the interpretation of measurements it must always be taken into account whether the control loop is currently in such a transitional phase with the changing values (transient) or in a stable state (steady state). Since processes of bone resorption and bone formation in particular, continue over several months to years, it is important not to simply interpolate transients linearly. For example, bone loss measured over several months can not be assumed to continue in the coming years. Rather, after some time, a new steady state with decreased bone mass will be achieved. This also shows how important it is to consider the changes in the individual and to distinguish between transients and steady states. When averaging out the values in a group of this crucial information is completely lost.